What if Barack kept his BlackBerry? 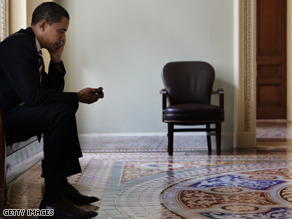 Obama is finding it difficult to give up his BlackBerry. President-elect Barack Obama is apparently still getting used to the limitations the Presidency will place on his life , including restrictions or even a ban on his cherished BlackBerry device, which he says he's "still clinging to." So what if Barack kept his BlackBerry? The answer isn't nearly as complex as solving some of the nation's more serious problems, but it also can't be answered in a sound bite. There are security, legal, personal, even political issues that all come into play. The security required by a sitting - or in this case, a very mobile - U.S. President is far greater than that required by you or I, or even a U.S. Senator. BlackBerry communications are encrypted, but while the level of encryption for is good, it's not the best the U.S. government has. Now Mr. Obama's a very astute dude, so we can be pretty sure he'd be able to decide what's too sensitive to send out over BlackBerry's airwaves. But then there's the issue of the BlackBerry Infrastructure network itself. The BlackBerry device is produced by Research in Motion (or RIM), a Canadian company. Even though organizations can operate their own BlackBerry Enterprise Servers, all BlackBerry traffic ultimately travels through the RIM network. As you may recall, the RIM network suffered outages in April 2007 and February 2008 that left all BlackBerry users without connectivity. The company, whose 2007 annual report claims it processes over a billion wireless data packets each day, was heavily criticized because all communication traffic was routed through its Waterloo, Ontario data center. In June, the St. Louis Business Journal wrote that RIM had purchased a 150,000-square-foot facility in Plano, Texas that reportedly will also handle BlackBerry traffic. Even so, does the United States want personal communications from the President of the United States to travel over a communications network operated and controlled by a company in a foreign sovereign nation, even one as friendly as Canada? RIM now appears to be decentralizing that data routing. That means, maybe, that BlackBerry traffic originating in the U.S. is likely to route through the Plano operations center. But that decentralizing leads to another security question. If the President travels outside the country, say to China, will his BlackBerry traffic be routed through a data center in China? Do we want personal communications to and from an American President running over a data center operating at least under the nominal control of a possibly unfriendly foreign power? What if he loses the thing? In Where Have All The Emails Gone? I discussed how Karl Rove lost his BlackBerry repeatedly, and what could happen if information on that device got into the wrong hands. Even a simple draft press release about an upcoming (but, for now, top secret) attack could cost lives. What else could be on such a device? Plenty! Old-school BlackBerry phones - from a year ago or so - could store about 64 megabytes of data. How much is 64 megabytes? The King James Bible is about 1,120 pages, or about 2.5 megabytes. So a typical 64 megabyte BlackBerry could hold about 25 King James Bible's worth of information. That's the equivalent in private Presidential information of about 28,000 printed pages, or seven complete sets of all seven Harry Potter novels. Admittedly, if Mr. Obama's BlackBerry has a good password, the data would be hard to extract, even if it fell into the wrong hands. And if the BlackBerry does get lost, it can be remotely locked and erased. Even so, do we really want to pit the security technology of some company in Canada against the full might and resources of any enemy nation-state determined to extract secrets from an American President's BlackBerry? Mr. Rove isn't the only senior White House official to have lost BlackBerry devices. Last April, Rafael Quintero Curiel, lead press advance person for the Mexican delegation, was caught stealing BlackBerry devices belonging to White House staffers who were attending meetings between U.S. President George W. Bush and Canadian and Mexican leaders in New Orleans. He had control of those devices for at least 25 minutes before they were returned to the Secret Service. Is your BlackBerry spying on you? That's an important detail, because it brings us to a new question. What could be put on Mr. Obama's BlackBerry if he happens to set it down or hand it to someone for "safe" keeping? The answer, which on the surface seems wildly paranoid, is actually quite disturbing. There is software easily obtainable on the Internet for about $250 that can turn pretty much any smartphone into a remote bugging device. Think about it. The typical BlackBerry has a microphone. What if everything said in proximity of the President was relayed to a remote listener? The typical BlackBerry has email. What if every email message sent and received by the President was relayed to a remote observer? Most BlackBerrys have GPS. What if the location of the President was dynamically relayed to bad guys in waiting? This software is real and can be installed on most BlackBerry devices. Once installed, it's completely undetectable. And it wouldn't require President Obama's password to install. All a bad guy needs is to have hands-on access to the phone for about five minutes and the software is downloaded and installed from a remote Web site. Here's a tip: don't ever let anyone else hold onto your phone. Scary stuff. Legal issues will also crop up if Obama keeps his beloved BlackBerry. Two immediate considerations: the Hatch Act of 1939 and the Presidential Records Act. The Hatch Act is a strange beast. It was originally created as a way to prevent federal employees from joining any organization whose goals included the overthrow of the United States government. Today, the Hatch Act allows federal employees to participate in political parties, but prohibits them from engaging in political activity while on duty. * It forces White House staffers to use private-sector resources for communication, bypassing the government's security resources. * It gives politicians in the White House an excuse for bypassing Presidential Records Act requirements. Fortunately for Mr. Obama's BlackBerry cause, the Hatch Act specifically exempts the President from these requirements. But if Rahm Emanuel wants to keep his BlackBerry, he's going to need to send some messages over the government network and others over a private network. I've recommended the Hatch Act be amended so that all senior-level government email communication, political or otherwise, go across secured government systems, but that's a discussion for another day. This brings us to the Presidential Records Act. This Act governs how Presidents must manage their records. The key here is the definition of the term "record." A two-line email message to Mr. Emanuel would probably be considered a "record" that requires long-term archiving. An email praising Malia for her latest "A" at Sidwell Friends probably does not. And that brings us to the personal question. BlackBerry email is among the least filtered, least considered, and most off-the-cuff communication method of any in use today. It may or may not be wise for the President-elect to quickly jot off responses or comments - since everything he says or does will be subject to the most minute scrutiny. Finally, there is the political question and the issue of access. Access to the President of the United States is considered the most elemental of political currency in Washington. If Mr. Obama has a BlackBerry at his side, that may well change the equation of access. Normally, for someone to get to the President, that person has to pass through a gauntlet of gatekeepers. But if Mr. Obama has a BlackBerry, anyone to whom he gave his BlackBerry email address would be able to gain some level of his attention - bypassing the gatekeepers completely. So, what if Mr. Obama kept his BlackBerry? What procedures would need to be put into place to make sure he's safe and secure while using it? Obviously, security is the biggest issue. Imagine if each President had to hire "some guy" to protect him while out in public. That was the case for all Presidents before Teddy Roosevelt. In fact, Roosevelt created Secret Service protection for Presidents because of the McKinley assassination in 1901. Now, however, the exceptionally professional Presidential Protective Detail protects the President of the United States and his family. The Secret Service uses sets of very carefully established procedures to ensure the protection of the President and is run by career professionals who have years of expertise and experience in Secret Service operations. Sadly, nothing with the professionalism of the Presidential Protective Detail exists for managing White House email and gadgets like the BlackBerry. Internal email management is left to the whims of the IT staff currently employed by the sitting administration. I recommend the establishment of a career Electronic Communication Protection Detail, managed under the auspices of the Secret Service, with the same level of mission-centric attention to detail and professionalism as the Presidential Protective Detail. With the electronic detail in place, some security concerns could be overcome. If he has to set down his device, he could hand it to someone on the detail staff. Members of this group can take direct responsibility for managing the device. I believe the Secret Service is uniquely qualified to establish this detail because of its dual missions of Presidential protection and computer-based criminal investigation. The Secret Service operates a network of Electronic Crimes Task Forces and Working Groups, so most technical expertise needed to establish an electronic detail is already in place. The mission of the Electronic Communication Protection Detail needs to include the safeguarding of White House email security, the safeguarding and reliable archiving of all messages, and the overall management of email, instant message, cell phone, and BlackBerry communications within the White House staff - and if Mr. Obama keeps his BlackBerry, with special attention to the President. Having one group managing electronic communication across administrations - and one with an excellent track record of protecting the President and the White House - would make both White House email and Mr. Obama's BlackBerry far more secure. I've included management of cell phones and BlackBerry-style handheld PDAs within the mission of the proposed Electronic Communication Protection Detail because these devices are more powerful than many full-sized computers were during the Reagan Administration, and there's huge risk if these devices are mismanaged. Since email, computer files in the form of attachments, key contact lists, phone numbers, home addresses, and so much more are stored within these tiny potential nightmares, they need the same careful and integrated oversight that White House email should be getting. Finally, there is one other option. If Mr. Obama is willing to switch brands and use a Windows Mobile device instead of a BlackBerry, General Dynamics offers the Sectera Edge, an NSA-certified Type 1 ruggedized smartphone, developed for the National Security Agency's SME PED (Secure Mobile Environment Portable Electronic Device). The operating system is not as refined as his BlackBerry, but this device might go a long way to providing the security he will need. If Mr. Obama wants to keep his BlackBerry, I think that's great. Presidents often get too cut off from the real world, and Mr. Obama's BlackBerry may well be his lifeline to the living, breathing world outside the bubble. That said, if the President-elect does get to keep it, he's going to have to keep in mind the resulting changes. He'll have to remember, for example, that every "OMG" and "ROFLMAO" may become part of the public record. But, most important, he would need to approach his Blackberry communication with the same careful deliberation he's shown in his campaign and in the transition. It's not just a piece of office equipment or a decorative accessory. And if Mr. Obama keeps his BlackBerry while President, that BlackBerry will become one of the most strategic communications devices operated by the United States of America. It will vastly eclipse the famous red telephone. Editor's note: David Gewirtz is Editor-in-Chief, ZATZ Magazines, including OutlookPower Magazine. He is a leading Presidential scholar specializing in White House email. He is a member of FBI InfraGard, the Cyberterrorism Advisor for the International Association for Counterterrorism & Security Professionals, a columnist for The Journal of Counterterrorism and Homeland Security, and has been a guest commentator for the Nieman Watchdog of the Nieman Foundation for Journalism at Harvard University. He is a faculty member at the University of California, Berkeley extension, a recipient of the Sigma Xi Research Award in Engineering and was a candidate for the 2008 Pulitzer Prize in Letters. I think that our concerns should be directed toward more important issues. Our country is in a recession and all some seem to worry about is that President-Elect Obama is still using his Blackberry. Let's be realistic, he's an adult; and therefore, I'm pretty sure that he knows that there are a number of priviledges that he now has to relinquish. So instead of worrying about his phone, we need to direct our attention toward more important issues. For example, a better way to achieve a college education and the war in Iraq. A tech savy fanatic or fanatics plotting asassination could use Obama's blackberry as a tracking device and know his location. That's only one reason why he must–at the very least–limit using his blackberry. this comments is intended for Mr. Cooper, Mr. Robertson and Ms. Amanpour. Stop complaining about the israeli gov't and military for not letting the foreign media outlets , like CNN into the Gaza strip. This time it's a war! not a video game! it's a war of our survival, regardless what you and the other media outlets are claiming. The west has to realize, this war is not about land, this war is about protecting western values and civilization against radical islamist. which would do everything in their power to reach their goal. WAKE UP AMERICA AND EUROPE! When the Israeli authorities and military will decide that it's ok for the foreign media to come in, that's when you will be able to roll your cameras. Anderson Cooper – you are a courageous man. Why not tell America that Israel now uses dirty chemical bombs that burn its victims, many children, to the bones and reignite unless you extinguish the flames with sand? Read lefigaro.fr , watch their videos and TV programs for more information and talk about it if you stick to journalistic ethics and have the courage to report the truth. This Israeli agression must end. I see these little children get hurt by Israelis, suffering terribly, and then remember the little children driven to their deaths in Nazi gas chambers. Someone has to point such things out to unaware Americans. Our government has to stop this otherwise we are going to be attacked again by terrorists for our allegiance to this Israeli torture of innocent civilians and especially children. Nobody is entitled to kill and torture children. If they do, they should be punished. JC can I just remind you? Obama is still President-Elect! I believe what he has accomplished is that he got a transition team together, nominated people for cabinet positions, and has been talking to Congress and the american people helping to prepare them for what needs to be done, as well as gathering as much information that he can that will assist him with making the decisions that he needs to make. He is not our president yet! Nor should we think of him as such! George W. Bush is our President and will continue to be so until noon of January 20th! It's time for Obama to stop sending e-mails from his blackberry to his publisher about yet another memoir and start getting to work straightening out our once proud nation. While I actually voted for him, outside of a few tomes, what has he accomplished? Couldn't he keep on for personal use. I am sure that the US Govt has BBs for work use that he will get access to? I completely agree with Annie Kate! What's is the point of keeping your BB if your limited to how it could function? Not worth the stress! Lot of good reasons for Obama not to have a blackberry. Unfortunately, looking at all the risks I don't see how keeping it could be justified. The danger to him and to the country is too great.